After 6 days, the stiff and swollen feeling has resided from my calves and thighs. Hillary Swank, my time trial triathlon bike, sits in pristine state, freshly unpacked and swiped clean of layers of chinese silt, dust, sweat, gatorade, and other substances picked up in Hainan island, the "Hawaii of china". Initially I was disappointed with the race results. Actually, relief was the first reaction seconds after the race, than disappointment and frustration, than appreciation for my health and life experience. Swim: This turned out to be the easiest part of the race, despite the last minute confusion. I zigzagged too much around the turns and lost some valuable time. At one point, I found myself swimming with one other guy, looked for the rest of pack, and realized that I had swung too wide outside the turnaround buoy. I also swam too much breast stroke. The water was really murky, so I could not see and had to pull up into breast stroke. I pulled into the shore in around 31 minutes. It must have been shortened by 300 meters or so, since I had targeted about 40 minutes for 1.9k, and I didn't have a very fast swim. I could see my teammates pulling out of the water just in front of me as I hit the beach. 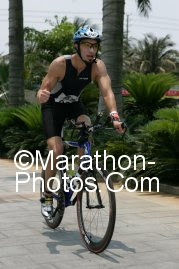 Bike: I was happy to get on the bike and whiz thru the course, but it didn't really happen like that. I realized that I had forgotten my socks, so had to ride barefoot, and my feet quickly blistered up. It was also very very hot, and only 9:30 in the morning. We were in for a scorcher...I cruised along the first few k and felt ok, but had no appetite. I stuffed a half power bar and gel down my throat anyway. I passed teammates Stuart and Mary pretty quickly, in the first 5k or so. After 15k, I had still no sight of Jay, and began to wonder if I was going too slow. My average speed was around 28 KPH at that point, which seemed too slow. I usually cruise at 33-35 KPH, but this was an exceptionally hot day. I finally caught up to Jay after 30k. He looked pretty good, and we chatted for a minute, before I headed off. At the 35k turnaround he was right behind me. I remember feeling overheated even at the the first 30k. The next 20k or so went ok, but than we turned off the highway at about 53k, into Dao Tang Village. I was feeling more hot and fatigue, and the hills and turns didn't really help. I did chat with a couple of riders as we headed thru the local villages, which were interesting and took my mind off the heat and fatigue. I was, however, more interested in getting the bike done quickly, but we slowed to a crawl at a few points. The roads were bumpy and steep at points. My average speed started to fall again below 29. At one point around 70k we climbed another village hill, than coasted down and hit a sharp right turn, where I almost crashed. There were no signs. I later learned that a pro had crashed and broken her arm at that point of the course. Villagers were so supportive, yelling constantly "go go jian yo" although they had probably never seen a triathlon before. It meant literally "gas station" or more appropriately "hit the gas boy!" I think the local villagers were more amazed to see us than any other race I have done. There were also nice things to gaze at on the side such as water buffalo, rice fields, quaint little alleyways and stores. We were in the real China. But I was getting cramps in my left thigh and calves, so really could not appreciate the scenary so much. I hit the gas pedal despite the heat and cramps.. At 80k, I was back on the highway and heading mostly downhill. I finally got into a fast groove as the cramps had resided, but I guess most was thanks to the slight downhill and wind. I pulled into the Sheraton hotel transition in just under 3 hours, almost exactly 30 kph..pathetic! Run: Than it all started to go pear-shaped. Actually I knew I was in trouble back on the bike, but my first few hundred meters confirmed that my legs were toast. I cramped up almost immediately, and had to pull over to stretch. I started to jog again, but the stiffness in my thighs was quite acute, and I could barely stand up. I sat down on the curb and rested for a minute, stretching the muscles, using my yoga 101 training. It worked somehow, and I got up and pondered on down the blistering road. At 2K I knew I would be run down by Jay, as I had seen him pull in on the bike a few minutes behind me. He came at about 3 or 4K. To my surprise, a few K later, Mika, another teammate from Singapore, came up from behind with a head of steam, probably faster than Jay. I tried to run with her for a grand total of 100 meters, but quickly gave up. I was now running 4 minutes and walking 1 minute for every 5 minutes until the 10k point. But I could not keep that routine going. Did I mention that it was hot? There was also limited shade. I saved the walking bits for the shade, so I tried to run thru the hot spots, which were many! After 10k, I was taking a walk break every 2-3 minutes. At 15k, I was walking more than running up the dreaded hot evil bridge. At the turnaround on the top of the bridge, I felt some psychological relief, and picked up the pace for 2-3k. I could not hold it for long, and the last 3k was excrutiating. It must have taken me 7 or 8 minutes per k for that last bit. I played little games with the other runners. I would run by a few people, than slow to a fast walk. They would pass me, than I would start running and pass them, than slow again. We did this for the last 10k. Maybe it helped...who can say..at the end I could see I was not even close to a PB, and it became a matter of finishing without injury. 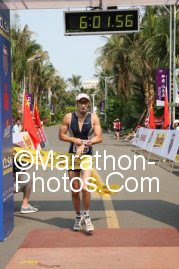 As I ran thru downtown Haikou for the last 2k, everyone chanted in unison go go jian yo. Than I would stop and go into my walking bit, and they would all crack up. "Why aren't you running? ", they seemed to ask....but I am sure they knew the answer...it was so hot that the spectators on the side looked really uncomfortable. At about 1k from the finish, I noticed out of the corner of my eye, a Japanese woman wearing all black long sleeves and pants. I could not believe it. There was no way she was going to pass me wearing that suicide suit. I accelerated using the last bit of gas (jian) in the tank, and pulled thru in an embarrasing 6 hours flat. The post-event festivities were quite nice. We all commiserated, lamented, and celebrated. It was great to meet so many motivated ironmen. Mika had a great race, finishing first in her age group and #4 woman overall! Jay had a nice effort too, and he placed 3rd in his age group. It was a great experience to go to China with all the athletes (Stuart, Mary, Mike, Mika, Jay, Agnes). I still have a lot of work to do for Zurich full ironman in July, but at least the heat won't be as harsh. I felt that this race was the hardest thing I have ever done. Those Nyu Yawkers just can't take the heat, lol. Naw, it's amazing to me that you can actually finish something that grueling. I don't envy you at all on that point. I wouldn't mind the biking but running doesn't excite me at all and I'd probably drown if I had to swim over a mile. Better luck next time to improve your results. sankyuu..that's what we hear often from people who haven't done tris before..hard to imagine..best thing to do is not think about..just do it like in the nike commercial!